This book addresses an old and basic question: what is the moral order of the market? ‘Corporate Wrongdoing and the Art of the Accusation’ is an exploration of accusations of wrongdoing and the revelations these accusations expose about the dark side of capitalism and modern corporations. This book addresses an old and basic question: what is the moral order of the market? 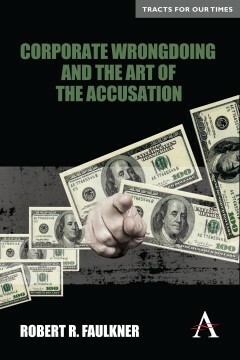 ‘Corporate Wrongdoing and the Art of the Accusation’ is an exploration of accusations of wrongdoing, and the revelations these accusations expose about the dark side of capitalism and modern corporations, and their relationships with suppliers, buyers, peers, investment banks and state regulators. The study explores data gathered from the past twenty years, including over a thousand accusations of economic wrongdoing in corporate America. The research traces exchange paths or structural routes; cultural recipes or ideas about wrongdoing; and interactions between the culture and structure of transgression in economic in markets. Repertoires of accusation, and the three-way associations between accused, accuser and accusation, reveal the moral order of the market. The tools provided in this data collection and analysis provide a template for the study of the three-way relationship between the following: cultural items or types (i.e., accusation types), structural locations or paths (i.e., market interfaces) and time (i.e., temporal locations of types and paths, or recipes and routes). Repertoires unlock the moral order of the modern market and other institutions (family, politics, education, religion, science) as revealed in accusations of transgression. Robert R. Faulkner is Professor of Sociology at the University of Massachusetts Amherst.